Devils Lake is an endorheic lake in North Dakota. Endorheic is the term for a lake or drainage basin with no outlet to an external body of water. Because the lake is endorheic, it can vary wildly in water levels in a period of a few years or decades. 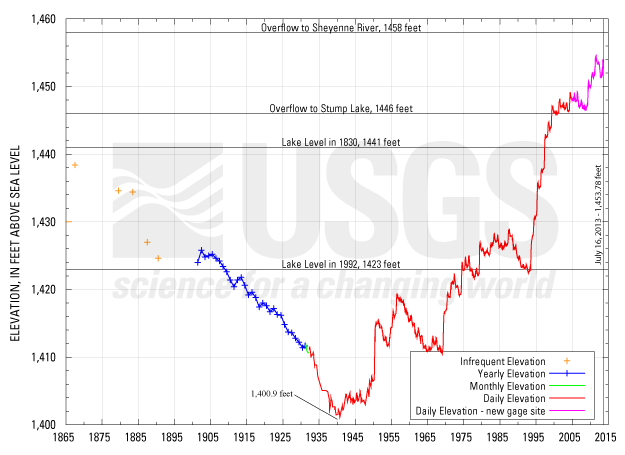 The water level in the lake is currently at about 1454 ft which is up 53 ft from the 1401 ft level in the 1940s. At 1446 ft, the lake overflows into nearby Stump Lake. This occurred at the turn of the century. If the water level reaches 1458 ft, the water will naturally flow into the Sheyenne River (this is only 4 ft higher than the current level). In the last decade, a man-made channel was constructed to connect the lake to the Sheyenne river, allowing relief during floods. Some of the reasons why Devils Lake has risen to high levels in recent times include increased rain during the 1990s and the altering of land for farming that in-turn increases the runoff rate. Check back in two weeks to see a drastic summer/winter change!